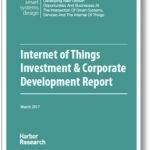 IoT investment in the month of March totaled $18.1B, but a majority of this includes Intel’s massive $15.3B acquisition of Mobileye. When adjusted to exclude this purchase, allocated capital was $2.8B, down from $3.4B in February and up from $955mm in January. The fiber consolidation continued this month, with MetroNet tacking onto their London assets, and Oak Hill quietly assembling fiber leadership in New England. 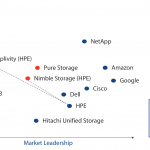 Other notable M&A actions include HP Enterprises diversifying into mid-market hyperscale storage with their purchase of Nimble, and a curious lack of interest in Landis+Gyr’s smart meter leadership. Mythic led the innovative companies in private investment this month after they raised funds for artificial intelligence on a chip, and a close second was Filament, who is using blockchain to secure industrial networks. Overall, March was a month highlighted by the connected car as Intel’s acquisition of Mobileye for a price of 70x enterprise value to EBITDA, on a trailing twelve-month basis (TTM), reflected the high demand for technologies in this market. But more importantly, the acquisition highlights a new world of investing strategy, where a future vision of technology and ecosystems is essential for survival. The connected car is similar to many of the Internet of Things (IoT) ecosystems emerging between industries that have previously never held relationships. Traditionally, these companies were segmented by their verticals, like the semiconductor manufacturers or the analytics software providers, but the internet of things is quickly blurring those lines. The IoT is forcing horizontal integration; companies are partnering and acquiring outside their core industry, in preparation for these blurred boundaries. Intel for example, has been heavily criticized for their valuation of the semi-manufacturer, but few have realized Mobileye’s potential as an edge-enabled software company. In the near future, analytics and communications will be processed on silicon located at the “edge” of the network, as opposed to the current process occurring in the cloud, and these chips will create massive data services for vehicles. So instead of simply expanding their chip offerings, Intel has expanded their position in the value chain by acquiring the ability to create, service, and own data. This new world of enabling services from connected hardware and infrastructure requires more creative business models and industry-pioneering partnerships, but those who do not adapt to this dynamic will quickly become vertically-siloed and left for dead, with the likes of movie rentals, physical maps, and bookstores.